With the Republican National Convention underway in Tampa, Fla., photographer Matthew Kraus shares some thoughts and images of a convention that hit closer to home. The few years following 9/11 were an interesting time in New York City. There seemed to be a closeness among New Yorkers that only such an event could foster. And there was certainly more than a little dissatisfaction in what our government was doing, partially in the name of that day. So when the Republican Party chose New York as the location of its convention during its 2004 bid to reelect Bush, there was a sizable amount of protest in all the usual places (the U.N., City Hall, Wall Street, etc.). Meanwhile in and around the East Village, I started noticing more and more signs, posters and predominantly stickers. On Friday afternoon, while asking East Villagers to reflect on the events of a decade ago, The Local happened upon a Roman Catholic priest and a Villager who asked to be identified as Monsignor Donald, blessing the home of Engine Company 28 and Ladder Company 11, at 222 East 2nd Street. The firehouse lost six members at the World Trade Center on September 11, 2011, and earlier this year, it lost another firefighter, Roy Chelsen, to bone-marrow cancer said to be linked to his work at Ground Zero in the weeks following the attacks. Here, Monsignor Donald talks about his work blessing local firehouses. On Friday, we shared John Vaccaro’s memories of September 11, 2001. Because he isn’t the only the one looking back on that day, The Local asked other Villagers some of the same questions that The Times posed to its readers: What was their strongest memory of 9/11? How did it change them, and America? What did they lose – or gain – because of it? Share your own reflections or reactions here, and if you’ve posted a video to the New York Times YouTube channel, leave that link in the comments. Back in June, The Local visited the home of John Vaccaro, one of the residents above Mars Bar who was being temporarily relocated so that his building could be replaced by condos. It wasn’t the first time the retired theater director had been displaced. On September 11, 2001, he was living just a few blocks from the World Trade Center while also keeping his loft on Second Avenue. In this video, Mr. Vaccaro describes fleeing ground zero and making an unexpected return to the East Village. Nearly ten years later, on July 21, he would officially move back to John Street, with a clear memory of that fall day. For much of America’s Muslim community, the 9/11 terrorist attacks changed their relationship with the rest of American society – for the worse. Broad government surveillance and discriminatory law enforcement policies, combined with an increased suspicion of Muslims by the general public, left many feeling that daily worship had suddenly become synonymous with terrorism. But a decade on, Imam Abu Sufian tells a different narrative. 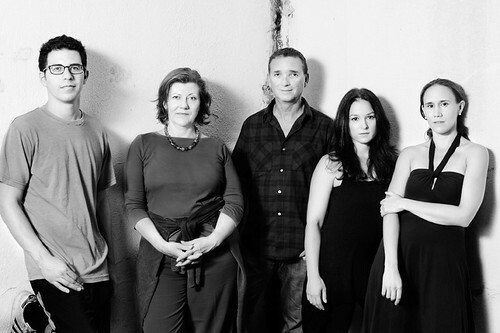 The cast, left to right: Andres Munar, Lynne McCollough, Guy Stroman, Lori Prince and Erin Treadway. Directed by Ryan Pointer, “nine/twelve tapes” is a fascinating reenactment of man-on-the-street interviews conducted by citizen journalist Collin Worster Daniels, mostly during the two days following September 11, 2001. Mr. Daniels had moved to New York shortly before the attacks, and was galvanized to capture the widespread disconnect among his fellow survivors. His tapes sat in a closet for nearly ten years before they were recently turned over to a friend of a friend, playwright Leegrid Stevens. 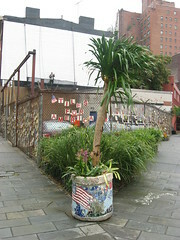 Stephen Rex Brown Jim Power’s planter honoring the 9/11 first responders at its new home on Seventh Avenue. A 9/11 memorial in the West Village got a surprise addition to its collection on Saturday. In a frenzied mix of patriotism and general disgust with the state of Astor Place, “Mosaic Man” Jim Power decided to move his planter dedicated to first responders from its original spot. Mr. Power said the decision came to him after learning that the Walk of Remembrance honoring Rev. 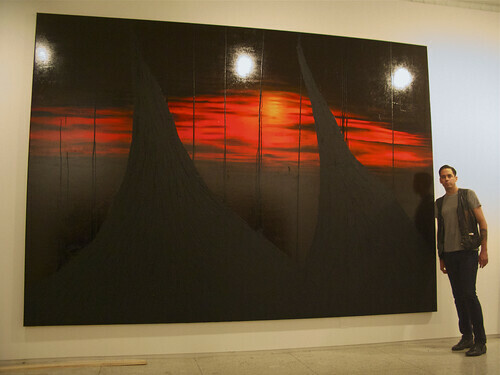 Mychal Judge, a firefighter who died while giving last rites to a comrade at the World Trade Center, would pass by the Tiles For America memorial at Seventh Avenue and 11th Street. 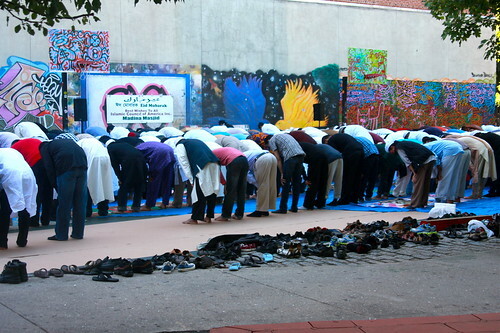 Rebecca Hamilton Another scene from yesterday’s Eid ul-Fitr prayers at Madina Masjid, the mosque on 11th Street and First Avenue. The Mirror checks in with Mike Kehoe, a firefighter at Engine 28 on East 2nd Street who survived the World Trade Center attacks. Roy Chelsen, the colleague who helped save him, has since died owing to what Mr. Kehoe heard was a 9/11-related illness. Prepare for another hot one today, as an excessive heat warning and air quality alert are in effect today for the entire city. Cooling centers will be open through Saturday, and you can find one here or by calling 311. In other neighborhood news, a truck used by the firefighters of Ladder Company 3 on 9/11 returned to the former site of the World Trade Center. Twelve firefighters from the company lost their lives when the North Tower collapsed. In a ceremony Wednesday, firefighters were honored as their truck was lowered into the 9/11 Memorial and Museum where it will remain permanently. Back in the East Village, the lot at 417 East 12th Street is about to get a major facelift. EV Grieve is reporting that Montreal-based architect Karl Fischer, designer of multiple luxury towers along the Bowery, is designing a six-story, 11-unit residence. In other building news, it’s moving day on 11-17 Second Avenue. Today, the final two tenants of the “Mars Bar” building will officially leave when John Vaccaro and Joe’s Locksmith close the doors behind them for one last time. And tonight, “Star Trek” will be playing in Tompkins Square Park as part of the Epix free movie series. The Local is told that Gilbert Gottfried will be on hand to introduce the show. John Galayda, Phillip Kalanztis Cope and Timothy Krause, community contributors to The Local, share their photographs of the celebration at Ground Zero early Monday morning. If you’d like a chance to see your best shots appear on The Local, join The Local East Village Flickr Group. Kathryn Kattalia For many in the East Village’s Muslim community a sense of closure after the death of Osama bin Laden still seems far off. Below: While much of the world watched news reports of Bin Laden’s killing, patrons at the Little Pakistan Deli watched a cricket match. On a newspaper stand outside the Little Pakistan Deli on Second Avenue, bold headlines announced the news many Americans have waited 10 years to hear: Al-Qaeda terrorist leader Osama Bin Laden is dead. While thousands of New Yorkers rushed to Times Square and Ground Zero last night to celebrate news that Osama bin Laden had been killed in Pakistan by American forces, members of the East Village Muslim community were hesitant to join in, saying closure is still some way off. Mr. Zaidi, whose store has been in the East Village between East 12th and East 13th Streets for more than ten years, said that many of his customers are Muslim cab drivers who stop in during their lunch break. 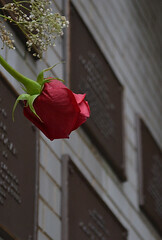 A single rose marked plaques remembering firefighters killed in the line of duty. At Engine 28 and Ladder 11, six in all mark those who died at the World Trade Center on Sept. 11, 2001 – five firefighters and one lieutenant. On this milky gray morning, the station house appeared almost abandoned. The engines stood mutely inside the garage and no men could be seen through the windows. It was a sharp contrast to the frenzy of action as firefighters rushed downtown almost ten years ago. At a ring of the station house bell, a young firefighter came to the door. He was not at the World Trade Center, he explained, and summoned his colleagues from the back of the station. Kevin Murray, a survivor of the rescue efforts was on duty, but in the hours after Osama Bin Laden’s death, the Fire Department is not permitting individual firefighters to talk to the press. Ian Duncan At Engine 28, Ladder 11. At the station on East Second Street, firefighters were on duty as normal and seemed in good spirits, happy to chat, if not to comment. 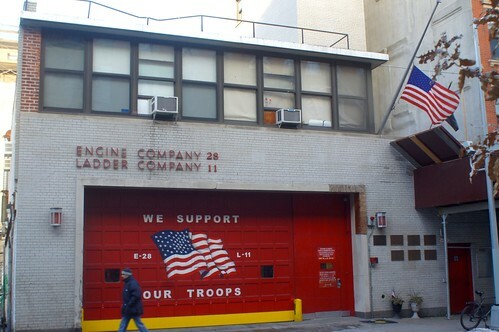 Across the firehouse door, the slogan “We support our troops” stood as a reminder of how closely tied New York’s fire department is to the events of Sept. 11, 2001 and the wars that followed. Just a few blocks over there was a hint at the rawness of the emotions brought up by last night’s news. A tired-looking firefighter on duty at the front desk at Engine 33 and Ladder 9 told The Local that the men there were not yet ready to share their thoughts and were still processing what they had heard. In all, 26 firefighters from the East Village’s four stations died on 9/11, according to department memorial pages. Across the city 343 members of the fire department lost their lives. 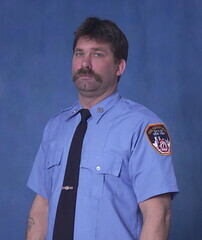 In January, Roy Chelsen, an Engine 28 and Ladder 11 firefighter who was at the World Trade Center on 9/11, died after a battle with bone-marrow cancer. His disease was linked to working in the toxic rubble of the collapsed towers. Suzanne Rozdeba Firefighters at Engine 28 and Ladder 11 mourn Roy Chelsen, who died Sunday of bone-marrow cancer and was credited with saving the lives of 11 of his colleagues on Sept. 11. 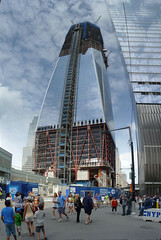 Already, the south tower of the World Trade Center had collapsed. But as Kevin Murray and Roy Chelsen huddled with their fellow firefighters for safety in the lobby of the north tower on Sept. 11 – debris and bodies falling all around them outside – no one knew what had happened. In all, Mr. Murray and Mr. Chelsen worked side-by-side for eight years as firefighters in the East Village. And they were side-by-side again Sunday just hours before Mr. Chelsen died after a long battle with bone-marrow cancer at age 51. 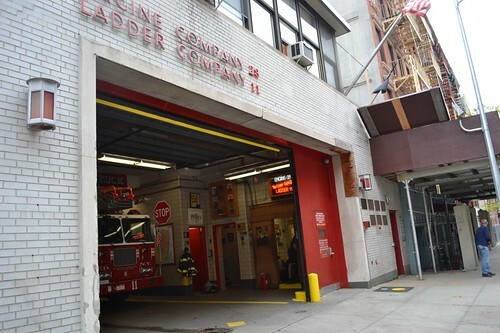 At Engine 28 and Ladder 11 firehouses in the East Village, the mood was somber today after firefighters learned of the death of Mr. Chelsen, whose cancer had been linked to his work digging through the rubble at Ground Zero in the days and weeks after the attacks. But Mr. Murray, who still works with Ladder 11 on East Second Street, said that the sadness at the firehouse was tinged with something else.